Armenian TV report on the recent Dilijan concert featuring Komitas’ music. David Brown’s review on LA Opus about our trio concert in Long Beach on April 7, 2019; featuring trios by Haydn, Chausson, and Schubert. Though the first of the sonata’s four movements is extensive, Mr. Vanhauwaert nonetheless observed the all-important exposition repeat, subtly varying his pacing and dynamics the second time around. 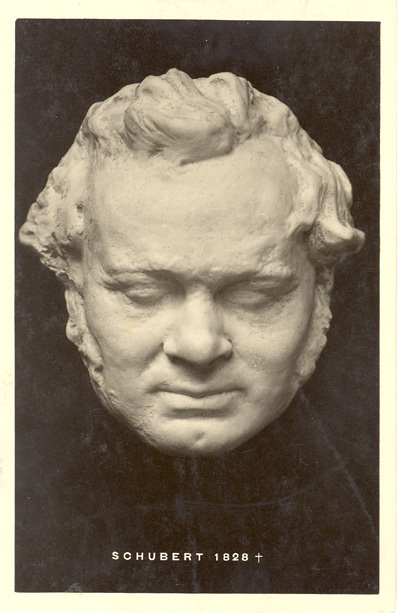 Here and later, his careful observance of Schubert’s dynamic gradations was a joy, for instance differentiating to just the right degree between fortissimi (ff) and sforzandi (fz). Many of Schubert’s late slow movements (the Ninth Symphony and Second Piano Triocome particularly to mind) have the overall shape of a calm or contemplative opening that leads to a central crisis and then by degrees back again. 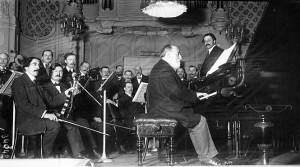 What happens in this sonata’s slow movement (deceptively headed Andantino) is the most extreme of them all: “for a few moments it is almost incoherent in its wild intensity,” as the BBC Music Guidesays, while for the pianist Mitsuko Uchida it is “the greatest mad scene ever written.” The composer’s despairing rage seems to threaten tonality itself, and defy the ability of his chosen instrument to express it. Mr. Vanhauwaert was as vivid and skilled as any pianist I have heard in the way he stormed up to the edge of the pit, peered into the void, and then drew back slowly to safer ground. Too few of the releases in the Hortus series Les Musiciens et la Grande Guerre have come my way, but those I have heard and the comments of colleagues about other discs have confirmed that this is an important and valuable series. With this release the project reaches Vol 26. 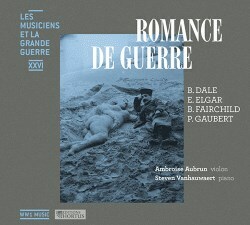 Here we have a French violinist and a Belgian pianist offering three substantial sonatas written during the war years. The pieces by Gaubert and Fairchild were unknown to me and my curiosity was further piqued by the prospect of hearing a young, non-British duo essaying the Elgar sonata. I learned from Michel Stockhem’s valuable notes that Philippe Gaubert had an important career in French music as a composer, teacher and conductor. He began his musical life as a violinist but fairly soon switched to the flute. During the war he served at the front line as a musician and stretcher-bearer in the French army. In fact, his A major Sonata was written in the trenches at Verdun and was dedicated to Cortot and Thibaud, no less. Though it is, therefore, literally a product of the trenches it is not an angst-ridden composition. It’s in three movements though the second consists of two sections, one marked Très lent followed by one marked Très vif scherzando; helpfully Hortus track these two sections separately. The first movement, simply marked Allegro, is a sweeping romantic movement. 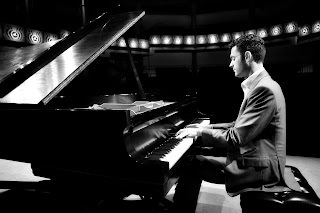 The music is confident and positive in tone – despite the physical environment in which it was written. The melodic material is excellent and the emphasis is on cantabile lines which Ambroise Aubrun exploits to the full. The singing quality of the violin is again much in evidence in the first part of the second movement. Here, Gaubert taps a vein of gently inward lyricism and the music is most appealing. The scherzando half of the movement calls for dexterity on the part of both players and neither Aubrun nor Vanhauwaert is found in any way wanting. Even here, though, there’s a good deal of cantabile writing. Michel Stockhem says that the finale marks “a return to joy, pithy and brilliant.” Whilst I wouldn’t disagree, the positive side of the music mingles with several passages that are more pensive in nature. Ambroise Aubrun and Steven Vanhauwaert are persuasive advocates for Gaubert’s sonata and I enjoyed both work and performance very much. They also make a strong case for Blair Fairchild’s sonata, which is actually his second sonata for violin and piano. Like the Gaubert, this sonata is dedicated to a well-known musician; in this case the violinist, Samuel Dushkin (1891-1976), who is described in the notes as Fairchild’s protégé. Fairchild had an interesting background, for details of which I’m again indebted to Michel Stockhem’s notes. He was born into a wealthy Boston family and served as an American diplomat while at the same time pursuing a pretty full musical education – there was time for such “distraction” in those days, I suppose. He came to Paris in 1903, on a diplomatic posting, I infer, and took the opportunity to study with Widor. Thereafter, he developed a lifelong attachment to France and its culture. His Second Sonata is cast in four movements. The first, marked Moderato, is in the rhythm of a Siciliano and the music has a pleasing lyrical flow. An Allegretto vivo follows. This is appealing and its character is rightly described in the notes as whimsical. The Quasi adagio third movement begins in an introspective mood. Gradually and impressively the music builds to an ardent climax after which Fairchild brings the movement back to the ruminative character of the opening. This is, I think, the finest movement in the work and it’s beautifully played here. The finale, which is marked Molto allegro, begins quite innocently. At 2:17 the piano introduces a fugue and after that has been worked through Fairchild brings his sonata to a close by reviewing some of the preceding thematic material. Aubrun and Vanhauwaert seem very well suited to the music and they put the sonata across very convincingly. I’m glad to have discovered the work through their advocacy. Elgar’s E minor Sonata is the one work on their programme with which I am familiar. It’s one of the trio of chamber works – the A minor Piano Quintet and the String Quartet, also in E minor, are the others – which Elgar composed towards the end of the Great War and in its immediate aftermath. These three pieces, along with the Cello Concerto, represent the last significant phase in his composing career. Though only two instruments are involved it’s a substantial work. Elgar wrote it for his trusted friend, W H ‘Billy’ Reed (1875-1942), who led the LSO between 1912 and 1935. Reed was closely consulted by Elgar over the composition of the Violin Concerto and, indeed, played the solo part in a private run-through prior to the premiere of the concerto in 1910. Another musician who was strongly identified with both the concerto and the sonata was the great English violinist, Albert Sammons (1886-1957). I mention both of these players because I know from hearing some of his recordings that Sammons was a commanding, big-toned player and I can only presume that Elgar must have thought Reed’s playing was also fully up to the rhetorical demands of his great concerto. Those considerations are relevant in considering Aubrun and Vanhauwaert’s account of the sonata. Let me say at once that there’s a great deal to admire in their performance and I relished the freshness of their approach. However, when I made comparisons with the fine 1971 recording by Hugh Bean and David Parkhouse (review), it seemed to me that their version had a spaciousness which I don’t quite hear in the Aubrun/Vanhauwaert performance. It’s relevant to note, I think, that Bean (1929-2004) was a Sammons pupil. However, if the newcomer stands, perhaps, outside the received English tradition, it brings its own rewards. The opening Allegro (risoluto) is pretty taut in the hands of Aubrun and Vanhauwaert and, indeed, there’s often a good degree of urgency in the playing, not least in the closing pages. This is a performance, I think, that takes a lot of notice of Elgar’s risoluto injunction. The slow movement, Andante (romanza), is suffused with the vein of melancholy that one encounters so often in Elgar’s music. Aubrun and Vanhauwaert respond to that well and also bring off successfully the short but ardent climax (around 4:38) before the movement subsides back into gentle melancholy. The finale, Allegro, non troppo, flows persuasively and the performers bring out the nobility in the writing as they deliver the closing pages. The programme closes with Prunella by Benjamin Dale. When war broke out in 1914, Dale was visiting Bayreuth. He was swiftly rounded up as an enemy alien and spent the entire war in internment, chiefly in a camp at Ruhleben. That’s where this attractive little miniature was composed. This is an excellent recital disc. Ambroise Aubrun and Steven Vanhauwaert give highly skilled, persuasive and committed performances of these works. Their programme is enterprising and the less familiar sonatas by Gaubert and Fairchild prove to be well worth investigation. The performances have been recorded clearly. However, for my taste the recording is a bit close. I welcome the clarity – and the instruments are effectively balanced against each other – but I would have liked more air and space around the sound of the instruments. The recording is too obviously studio-bound. Michel Stockhem’s notes, which are given in French and English, are very helpful.